What ended up being a fantastic week in the Lake District presented some challenging situations, but also offered up some valuable lessons. The first challenge of this trip is one which I always encounter during the planning stage of a trip like this - how much photography is it acceptable to do when you're on holiday? This is a problem I've had to deal with over a number of years - fortunately I have a very tolerant girlfriend. The solution: get up every day at 3:45am, go out, climb a hill, take a photo, go back to bed, get up again and spend the rest of the day doing holiday things. The weather was predictable - mainly rubbish with no sign of improvement. I did my best not to dwell on it and take the opportunity to enjoy the holiday. That said, within hours of arriving we were out in the car to scout the first location - Buttermere. The next morning, as planned, I was up at 4am to head back along the road to Buttermere. It was not a nice morning. The row of trees along the edge of the water were shrouded in cloud and you would barely have known there were hills behind them. 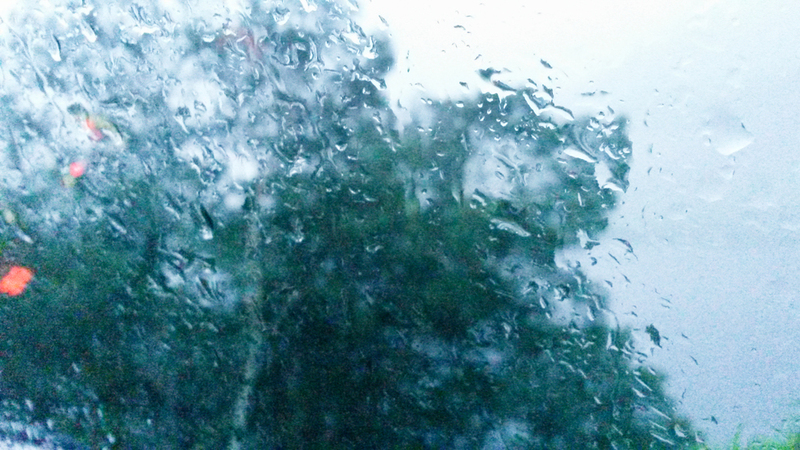 It's been a while since I've felt the painful sting of rain on my face and wind so strong I couldn't even open my eyes in the direction it was blowing. Nevertheless, it was an exhilarating way to start the holiday! Lesson 1: Look on the bright side. Even if it's overwhelmingly grim and you can't open your eyes. 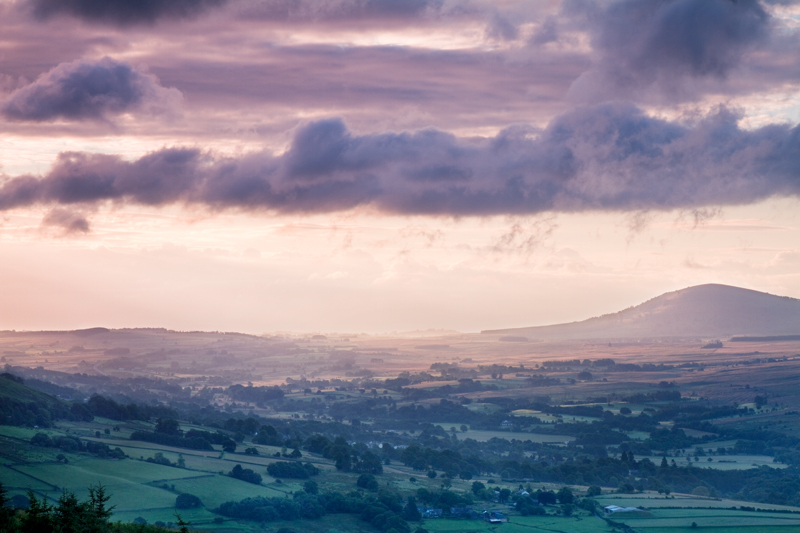 The next day I was up again at 3:45am to make my way up Latrigg. The weather forecast hinted at a slight improvement around the time of the sunrise. But when I reached the car park it was rather spooky setting off and trudging up the hill into the cloud. I wasn't feeling very hopeful of clapping my eyes on Derwent for the first time. But I did. Barely. As I stood at the summit I could see the clouds rolling in and smothering me, but at least it didn't hurt this time. The break in the weather never arrived. So after another disappointing trip up Latrigg and the second unsuccessful morning in a row I returned to bed for a few hours before getting back up to head out for the day. I knew it was far too early in the week to be disheartened, but I'd be lying if I said I hadn't begun to think the whole week would be a wash out. Lesson 2: It's not over until it's over. When I woke up again I was pleased to see that it had brightened up slightly. We decided to go out on a hike to the Cathedral Caverns near Little Langdale, unaware of how much of an undertaking this would be. I had seen pictures of the caves while researching the area in preparation for my trip, but what I hadn't been able to find was clear instructions on how to find them. So with a vague idea and a little helpful advice from a National Trust rep we set off from the village of Elterwater to find the caves. On what turned out to only be a 2 mile walk over a hill and through some fields we stopped and asked several groups of walkers for directions, none of whom had ever heard of them before. But eventually, following a lovely afternoon strolling around the Cumbrian countryside and despite the lack of any signage, we found the Cathedral Caverns. 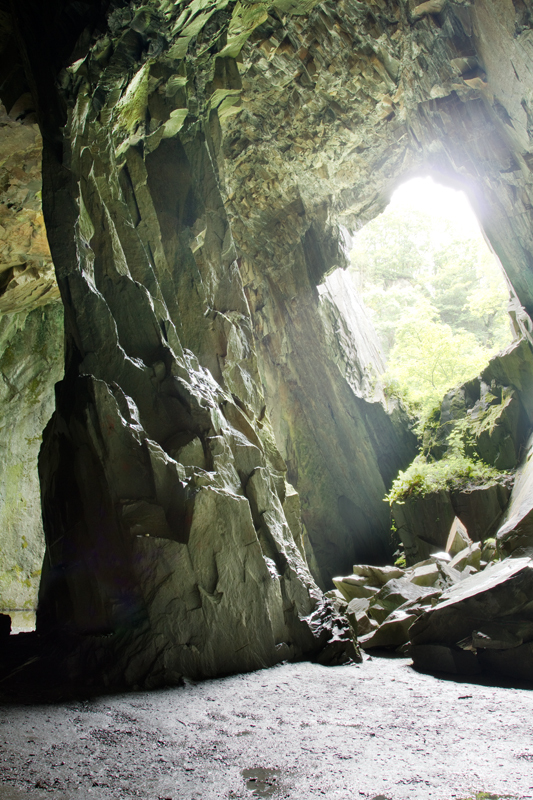 Having been bought by Beatrix Potter and gifted to the National Trust, the caves were quarried up until the 1950's. Since then the National Trust have maintained the site, which is well worth a visit. The Cathedral Cavern is a majestic 100ft cave which is part of an old slate mine with a massive gaping hole in one wall which lets light pour in and pick out the colour in the rock. Unfortunately, even though it's completely un-signposted and apparently unknown to locals with very little presence online, within minutes of our arrival the caves were teaming with groups of tourists and cyclists who appeared as if from nowhere. Lesson 3: Enjoy the surroundings you're in with the time you have, even if you can't get the photos you want. The Lake District, although known for it's lakes and meres, is also renowned for it's abundance of hills and spectacular walking routes. So it would have been rude of us not to do at least a little. Our holiday cottage was situated in Newlands Valley on the West side of Derwent Water, right at the bottom of the slopes leading up to the Catbells. The views in all directions are stunning, particularly the classic view looking back towards Keswick with the ridge to the summit in the foreground. But given that we were staying in the valley below it was a great chance to get a shot of the very landscape in which we were staying. 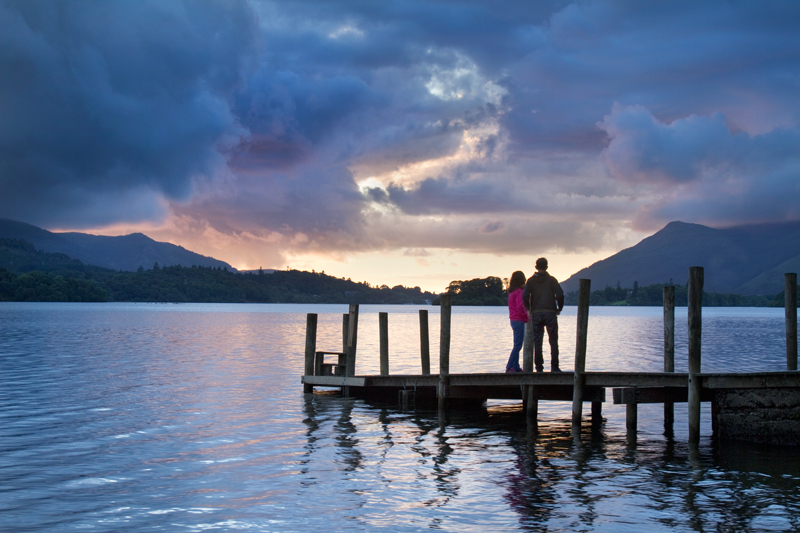 I still didn't have the shot from Latrigg I'd had my heart set on. So in the spirit of determination and perseverance I returned to the view point I had been on two previous days. Fortunately on this particular time I had more success. I reached my spot in plenty of time and could already tell that conditions were more promising than they had been during the rest of the week. This was the day my luck began to turn. The cloud base was higher than it had been all week and beginning to break up. Behind me, colour was starting to appear in the sky and shortly it found its way through to the slopes of the Catbells. Despite the improvement there was still something lacking from the scene and I felt compelled to try again. 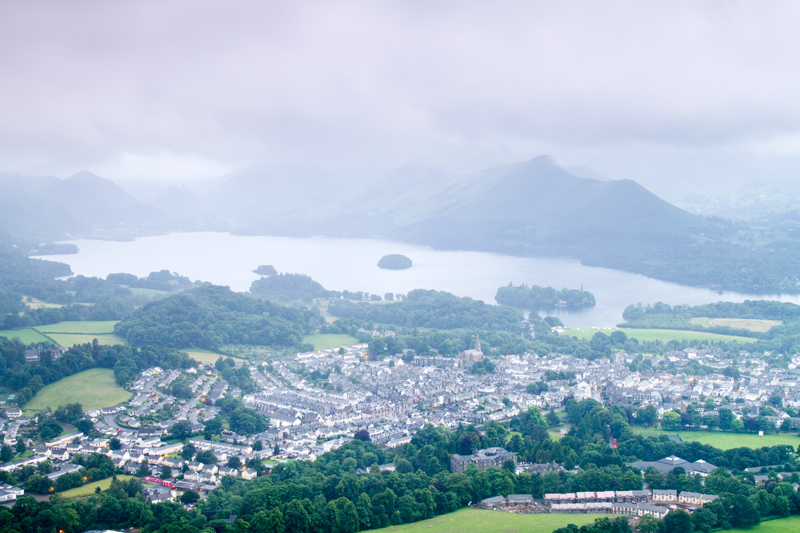 Once I felt I had exhausted the possibilities of this shot of Keswick I went further up the hill to scout out the view to the East for a potential shoot in the future. All morning I had been watching the light doing magical things to the sky on the other side of the hill from where my tripod was planted, too hesitant to move from my position and miss the "big" shot that I wanted. But as it turned out the light was far better from just over the summit, and had with it an excellent view of the Cumbrian landscape. This was a shot I definitely had to try again. Lesson 4: Take the opportunity to plan a picture for the future. Later that day I returned to a location I had scouted out earlier in the week - which again had lead to disappointing results - the stone circle at Castlerigg. The forecast wasn't terrific, but given my better fortune that morning, I was more optimistic than I had been all week and decided to go out anyway. Suffice to say, that was a good decision. That evening at Castlerigg I was treated to the best light I had seen since we arrived. Strong shafts of warm golden light broke through the heavy cloud which were casting deep dark shadows on the hills beyond the circle making a really bold and moody image. After a short and somewhat frantic period of dashing around hunting for the best composition, whilst fighting off several crowds of tourists with children and dogs, and one particular girl who kept running into the middle of the circle with a GoPro trying to take a timelapse, the sun began to sink behind the cloud that had injected all of the drama to the scene. Lesson 5: Sometimes it's worth going out despite the weather forecast. From my experience stopping here a few days prior, I knew the sun would disappear behind one of the hills behind me long before it actually set. I assessed the situation and realised that the sun wouldn't reappear from the cloud before it was hidden by the hill. I had to quickly make the decision to cut my losses, be content with what I'd been able to capture so far and head off somewhere else to try and catch the final moments of the sunset. And I knew just the place. I had scouted out this location that very afternoon. I knew it wasn't far and that I could park close enough to just dash across the road and set up. I arrived in time. Not only because the best of the light was still to come, but I also beat two other photographers to the perfect spot by a matter of minutes. A family stopped off to enjoy the same view that brought me there and wandered out onto the pier. One particular couple added the perfect subject to my photo. After a while I thought the weather was beginning to turn against me, I noticed heavy rain drops in the lake creeping their way towards the beach. Once they reached me, my fellow photographers and I began to dive for shelter. I was close to packing up and going home, content with what I'd been able to capture earlier in the evening. But then I thought back to lesson 2 (It's not over until it's over!) The shower shortly passed and the rain that I had only moments before been hiding from was the very rain that was illuminated by the red light from the sun. My family never understand when I complain that there's "not enough cloud" in my sunset photos. The reason is that you need the cloud to catch the colour from the sun and reflect it back towards me and my camera. Rain works even better. This was the first time in the whole trip I left a shoot feeling satisfied. Lesson 6: It pays to know when to cut your losses and try another location. 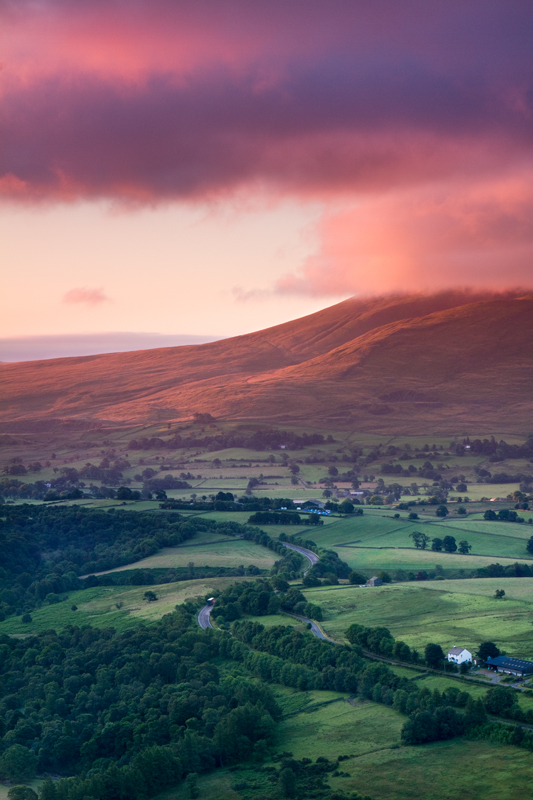 Hot off the success of the sunset the night before I once again made the walk up Latrigg. I knew from my previous attempt that the view East would be worthwhile capturing before the sun made it's way to Keswick and the hills around Derwent, so that was where I started. This was the third good decision I'd made in a row! 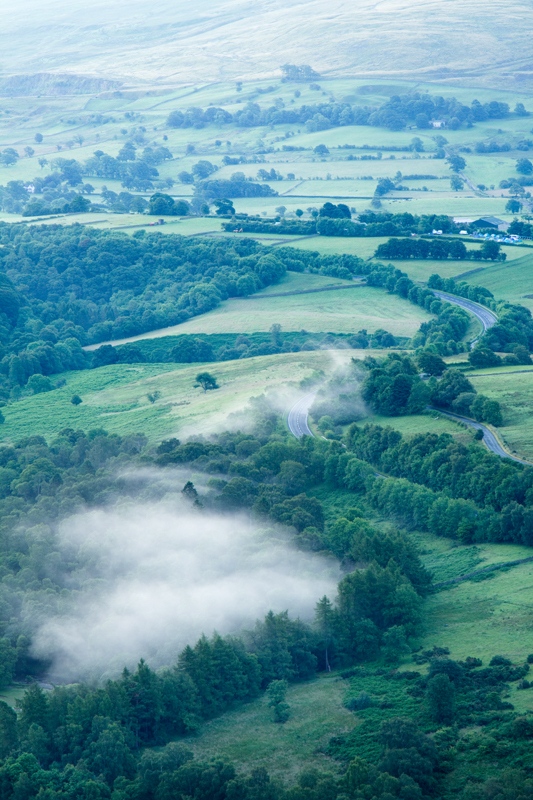 To start with there was puffs of mist clinging to the trees in the scene below me. I was able to capture some beautiful, soothing images with the road snaking it's way into the landscape. As the morning went on the clouds burst into life with colours of pink and purple which contrasted perfectly with the subdued greens still untouched by the morning light. 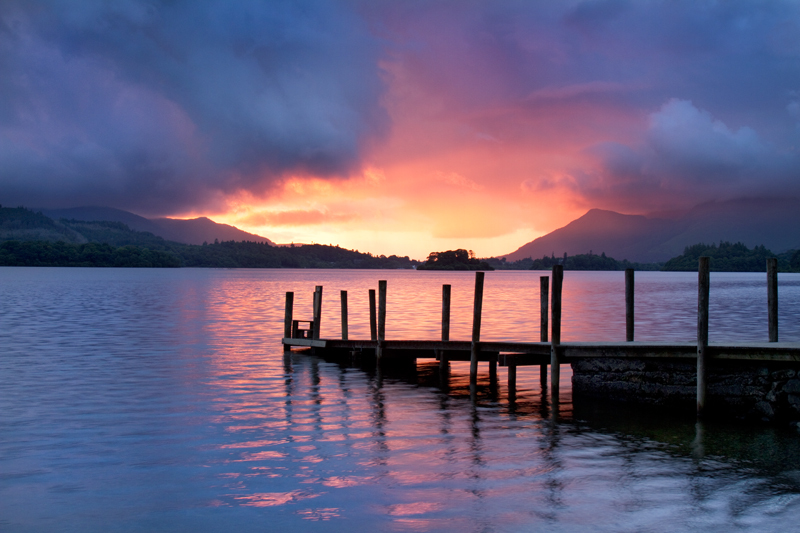 When the suns began to creep it's way towards Keswick I rushed my way over to set up at my usual spot overlooking Derwent, but on my way I had to stop to capture this particular scene. And finally, on our sixth day, after 4 visits, 3 frightfully early attempts, my perseverance finally paid off. The sun slowly but surely made it's way into my frame and perfectly lit up the town below me, with the church steeple standing tall in the bright morning light. This was the picture I had been waiting for all week. It was in this moment that I learned the most valuable and most resonant lesson from my trip. Lesson 7: Perseverance is the key. If I had let myself become entirely disheartened after just two days of disappointing weather and failed attempts, or if I had decided to give up on this particular picture, I wouldn't have left the Lake District feeling like I achieved most of what I had set to do.